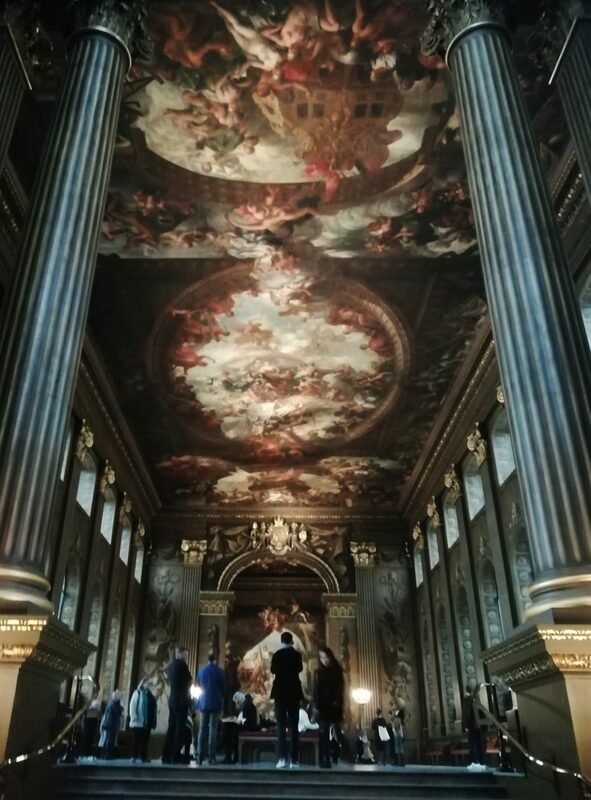 This Saturday, the 300-year-old Painted Hall at the Old Royal Naval College in Greenwich, reopens to the public, after a two-year, £8.5 million restoration. 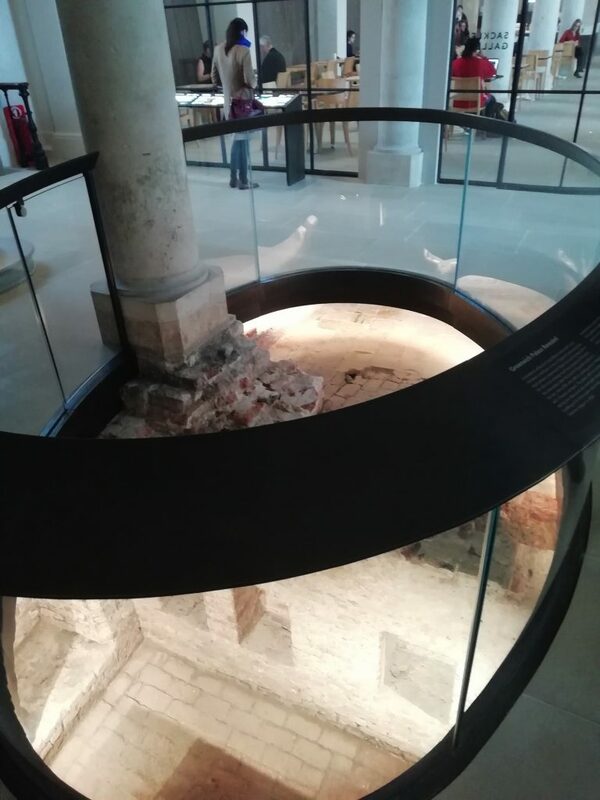 To help preserve the painted walls and ceiling, the old entrance has been permanently closed, and visitors now enter through the undercroft, which was previously a private dining hall for the Royal Navy, but now has a large cafe on one side and shop on the other, with admission desk at the end. At the far end is a small gallery detailing some of the history and relics of the hall. In this gallery, intriguingly, is an oval-shaped hole. Peering down through this space, you can see parts of the old Greenwich Palace that were discovered during the restoration work. Some tiles from the palace’s hall floor, and alcoves, thought to be for the storage of honey, can be glimpsed. A glimpse of the old Greenwich Palace. 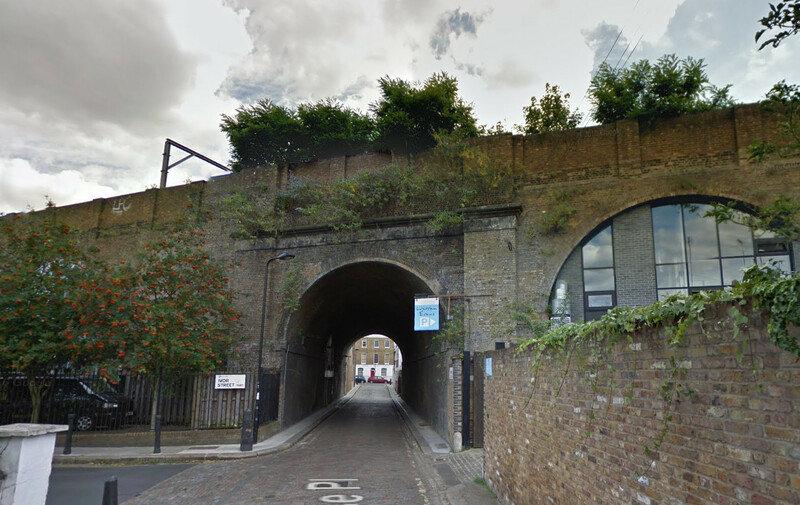 There is also a dead-end passage ahead which looks rather intriguing – this is the “Ripley Tunnel” which runs underneath the outside path that forms the main “axis” of Maritime Greenwich. 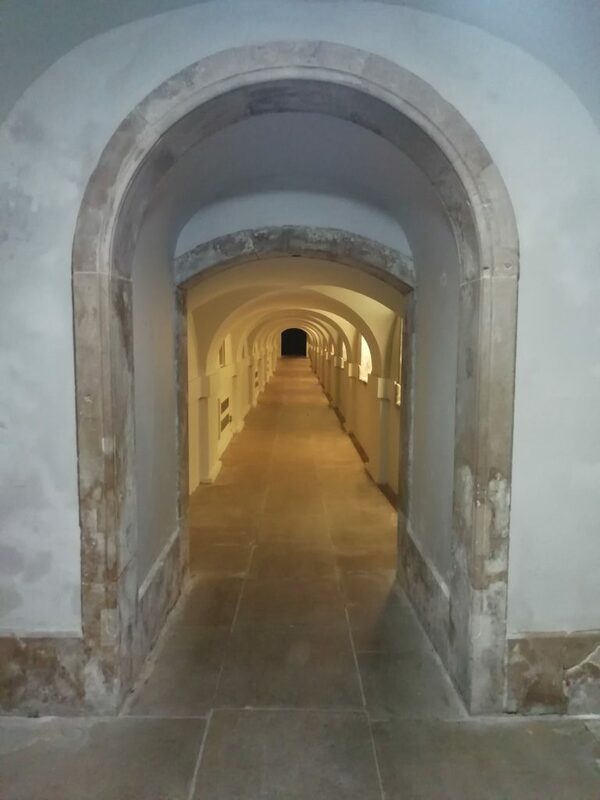 The tunnel runs between the Painted Hall and the Chapel. Visitors then proceed upstairs to the first “wow” moment which is the vestible. 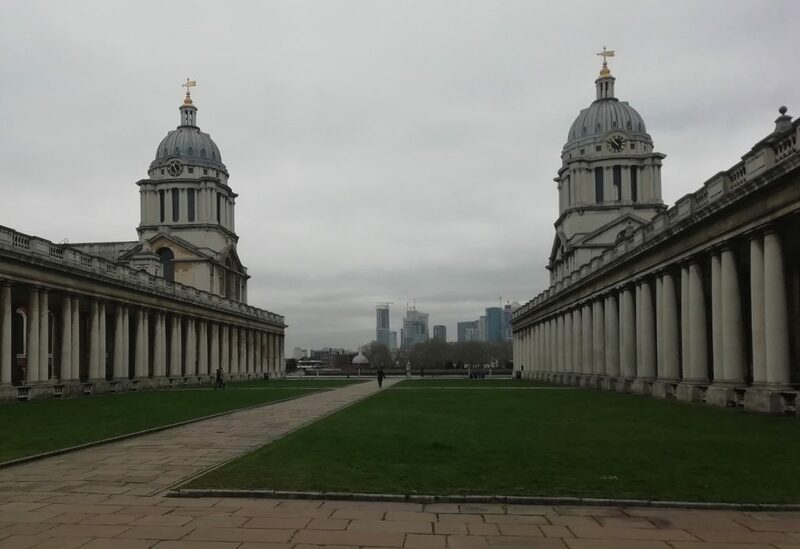 Look up, as you are directly underneath one of the two cupolas which define the buildings of Maritime Greenwich (the right-hand one, in that famous view from Island Gardens). Looking up at the cupola from the Vestible. 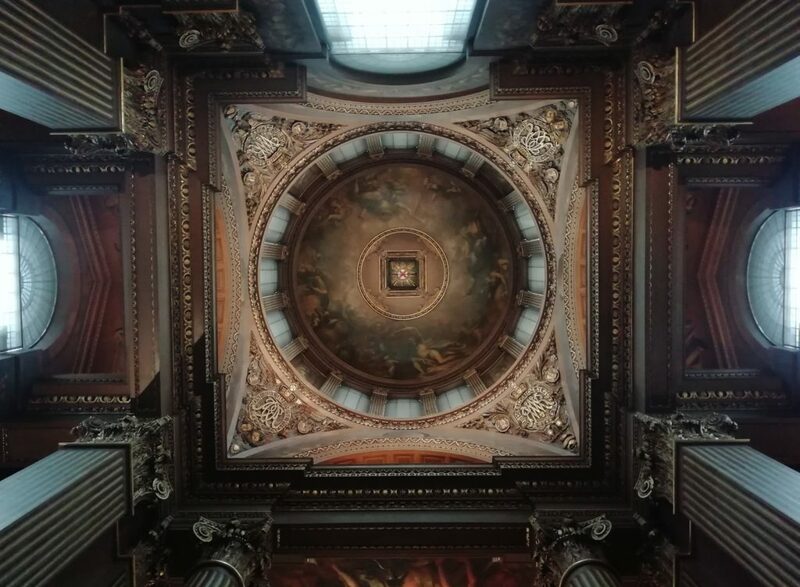 Up more stairs and you are in the Painted Gallery itself, with its breathtaking ceiling – the “Sistine Chapel” of the UK. Red cushioned seating, in the middle of the hall and at the sides, allow visitors to lie down and look straight up. The windows have net screen in front of them, to further preserve the paintings, but these also dim the whole hall, giving it a slightly spooky feel. 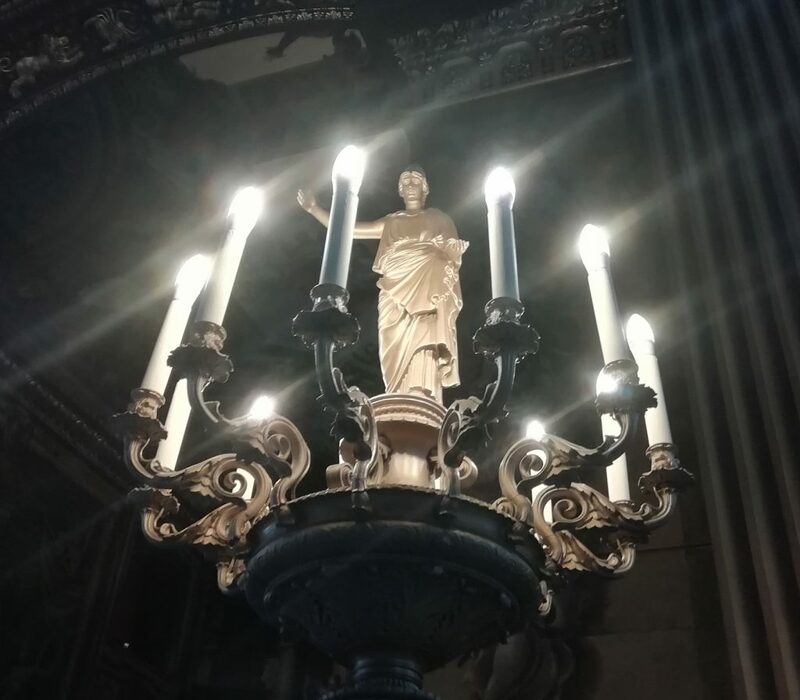 Discrete lighting ensure that the ceiling and other ornamental parts of the hall are lit. 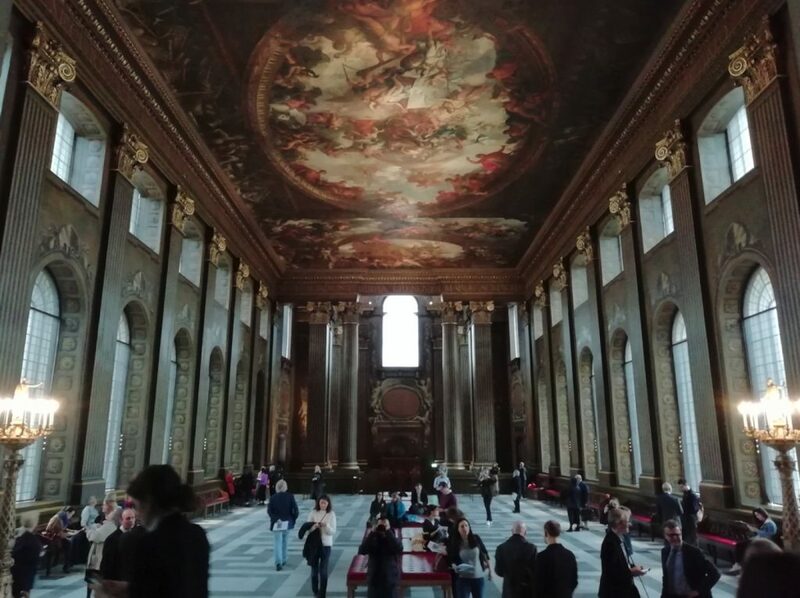 At the far end, the Upper Hall contains a plaque on the floor commemorating Lord Nelson (who lay in state at that spot) and his deputy, and another large mural on the wall. It’s undoubtably an impressive site. The hall is a big, mainly empty space – all the more to appreciate the walls and ceilings, and presumably also very useful as a flexible space for evening events. 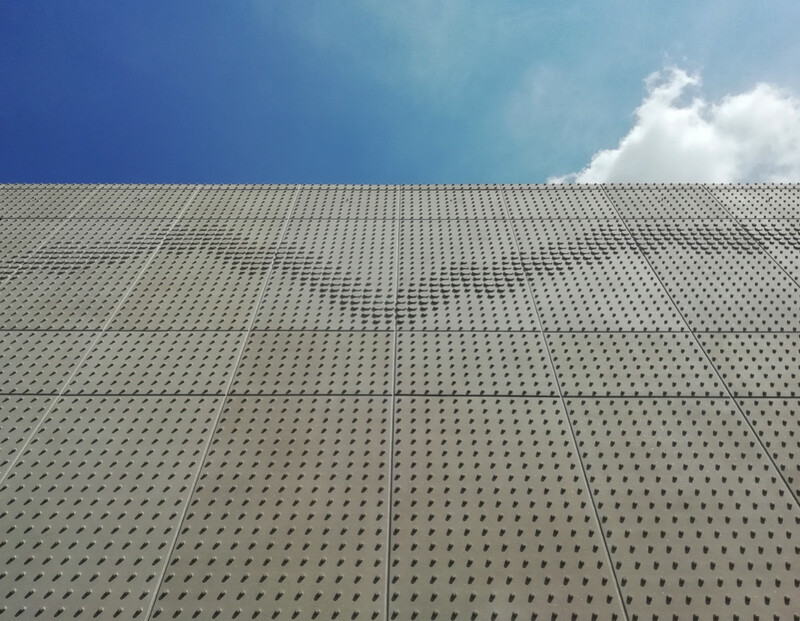 The backlit frieze at the entrance to the undercroft, showing Maritime Greenwich viewed from the north. 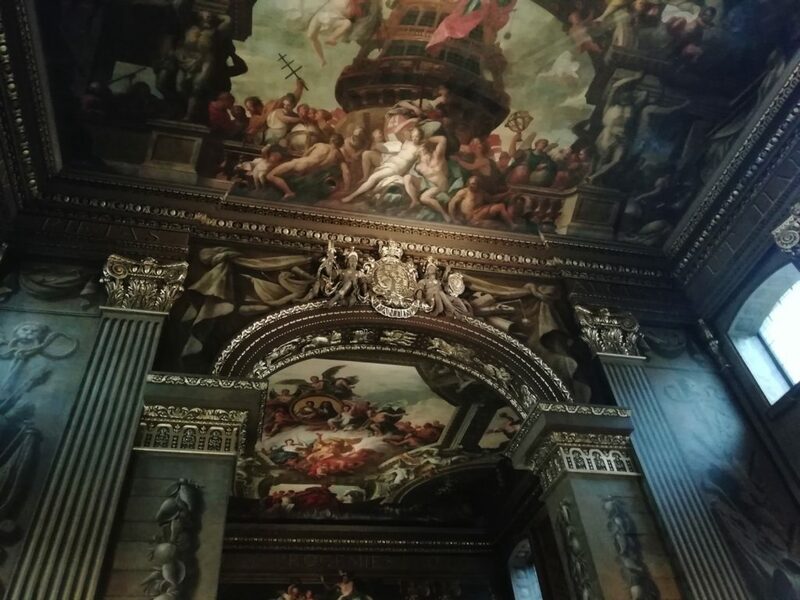 So, if in Greenwich, this is certainly worth visiting, along with its nearby attractions of the National Maritime Museum and the Royal Observatory Greenwich, both of which are a few minutes walk away – particularly on the first Wednesday of the month when you can get in for nothing. 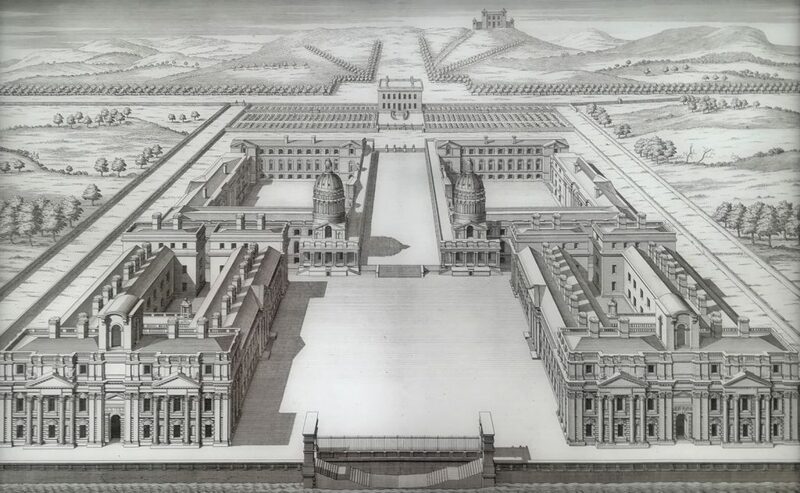 View from the south – the Painted Hall is in the building on the left. Since getting my most recent Huawei phone (using Android 6.0 “Marshmallow”), I’ve noticed that automatic syncing of my Garmin Forerunner GPS watch often didn’t happen automatically – even if the Garmin Connect app was open. Typically, restarting the phone would solve the issue, and allow a sync to happen – however next time, it would fail, meaning another restart was necessary. Very annoying! There was not a problem with my older Huawei phone, which was on an older (v4.0) version of Android. 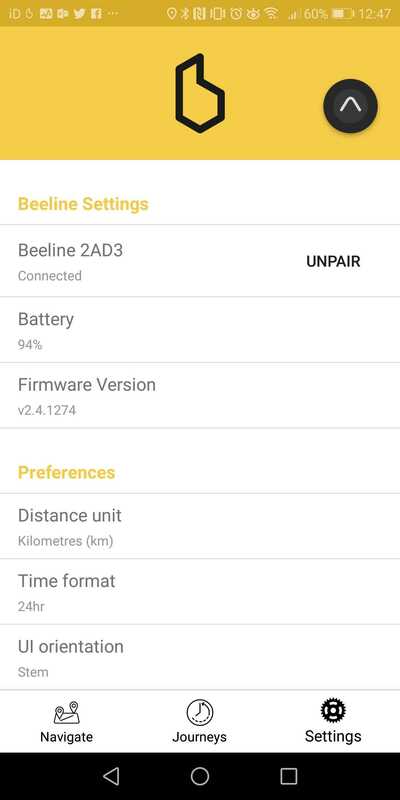 I recently acquired a Beeline smart compass for my bike, and immediately had the same issue. The initial setup was fraught, as it requires a Bluetooth connection, and I was only able to gain one, and pair it through the app, upon restarting my phone. After a few minutes, the connection would drop and, even though it was paired, the Beeline and phone would be unable to find each other. The problem is due to a bug in the way Huawei’s battery management of its Bluetooth connection to apps, works. 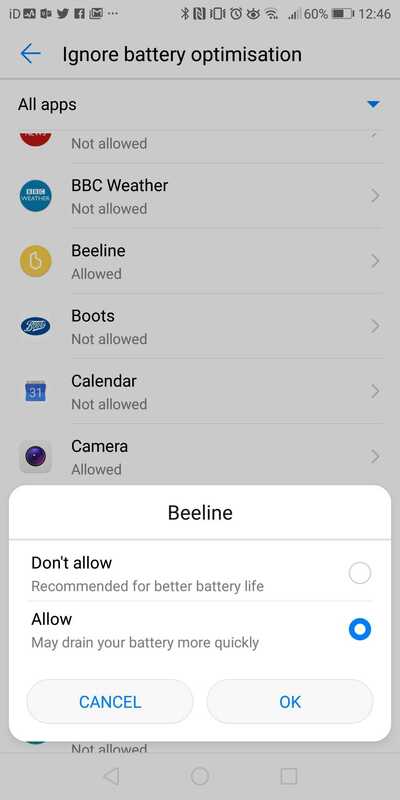 A simple configuration change was all that was needed, in order to fix both the Bluetooth connectivity between the Garmin Connect app and my Garmin Forerunner, and between the Beeline app and my Beeline device itself. Once I made the change, I was able to set up Garmin Connect so that it runs in the background, and now I don’t even have to manually open the app in order to sync, after a cycle ride. The change is surprisingly poorly documented, and also quite hard to find. Indeed it seems to have been specifically hidden away. Essentially, you need to disable Huawei battery management for the app. Press “Setting” at the bottom. Press “Special access” under the Advanced section. Press the “Allowed” dropdown at the top. Scroll to the app which is experiencing the Bluetooth connection issues. It will probably have “Not allowed” displayed below it. Choose the “Allow” option and press OK. 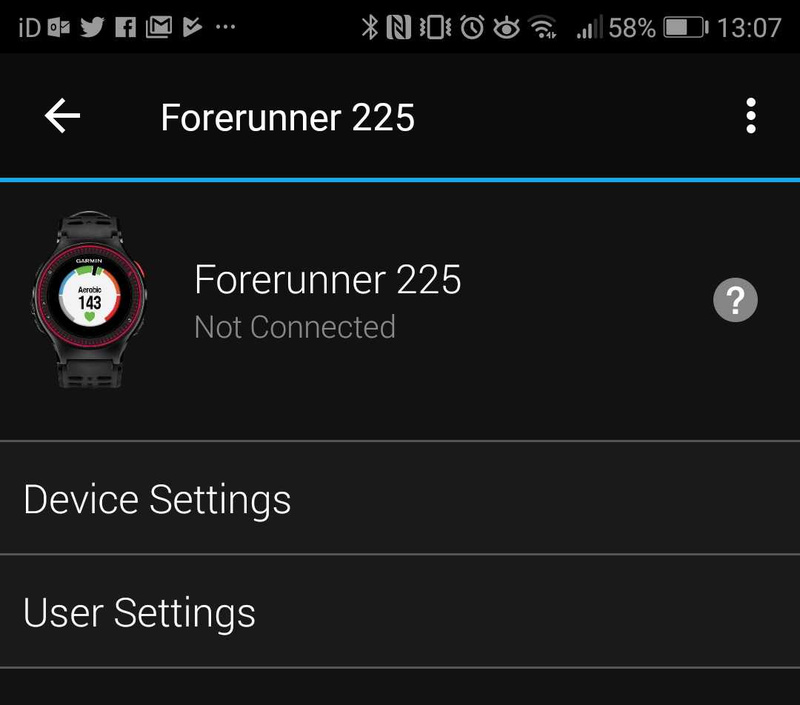 Your Beeline, or Garmin Forerunner, should now generally connect without issues. You have to wait a few seconds, and you may sometimes need to toggle off and on the Bluetooth function from your shortcut panel. But you shouldn’t have to restart your phone just to be able to connect your devices. 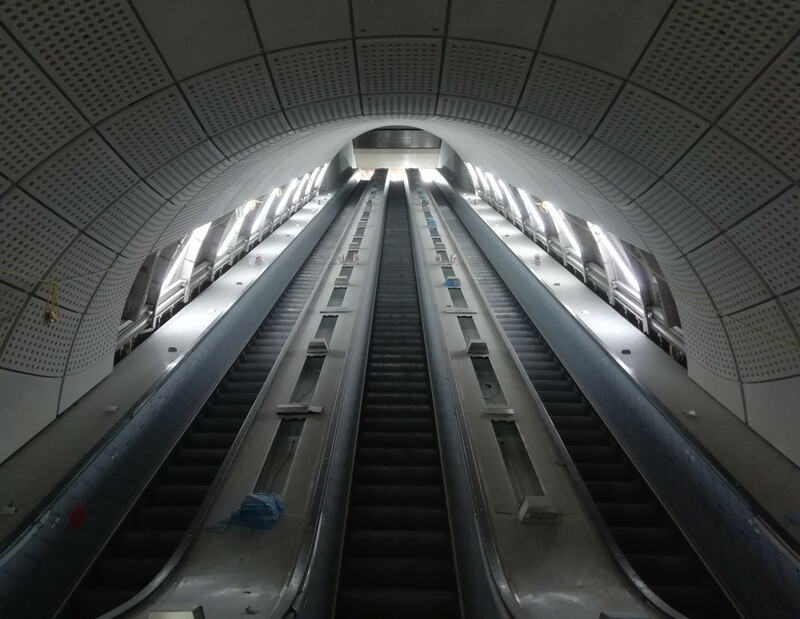 Crossrail, who are building the Elizabeth line railway across London that is due to open this December, held “sneak preview” open days recently at two of their stations – Whitechapel in east London, and Tottenham Court Road in the centre of the city. 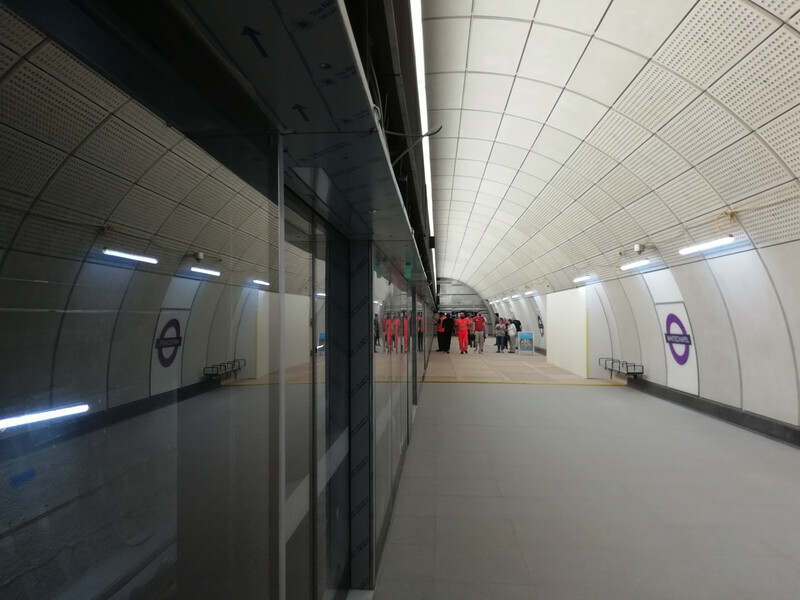 The previews were self-guided tours of part of the new sections of the stations, including the Crossrail platforms and ticket halls. 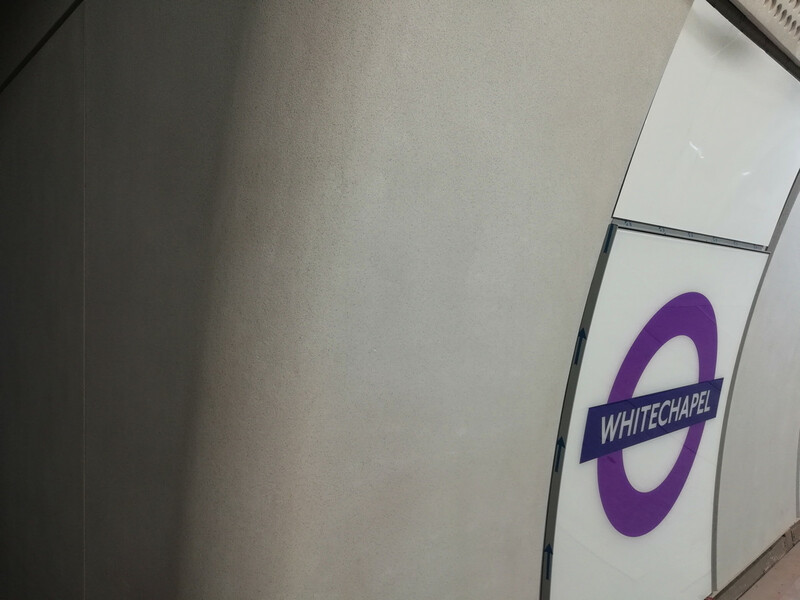 Here’s some photos from the visit to Whitechapel. This already has Underground and Overground platforms (the former famously underneath the latter) but the Crossrail ones are far deeper down both. 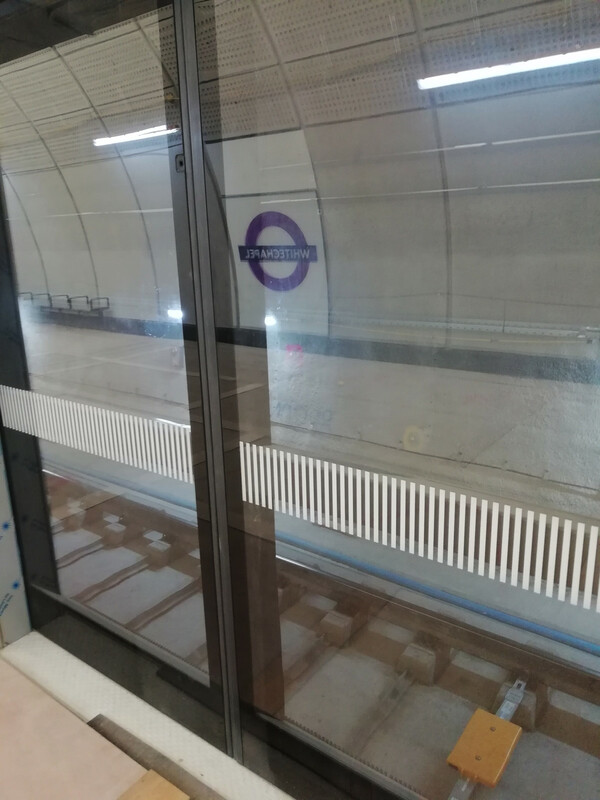 Whitechapel has an additional six months before it comes into use in May 2019 as an Elizabeth line station, when the Shenfield services start to be threaded with the Abbey Wood services, into central London. 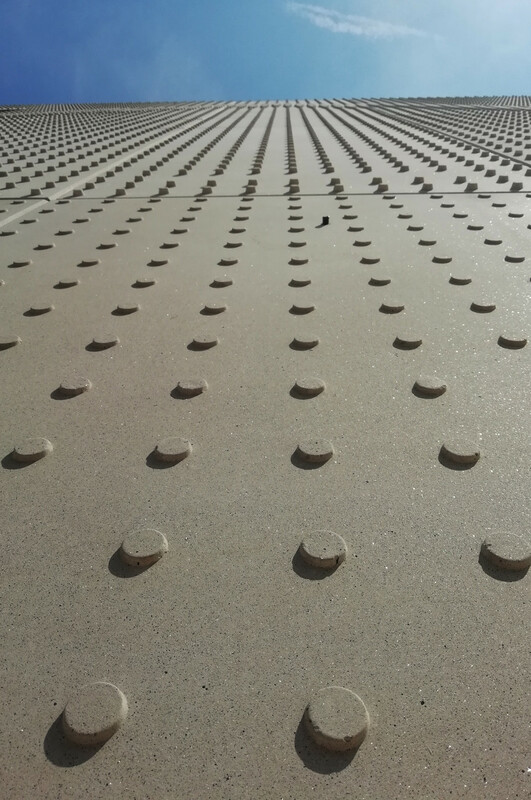 It was great to get out of the oppressive heatwave, down into the cool (for now) platforms of the Crossrail project. Is it possible to visit all 32 London boroughs (& the City of London) in a day? How quickly can you do it? 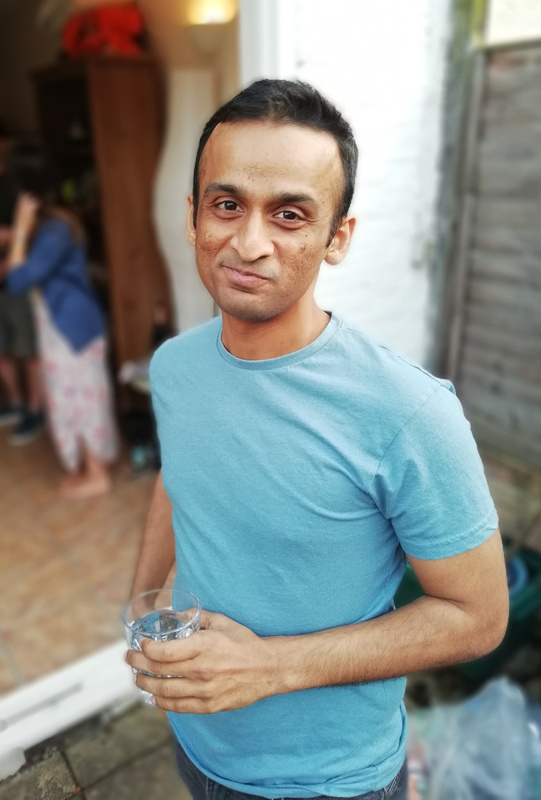 The “London Borough Challenge” has been on my to-do list for a while, and I finally got around to tackling the challenge on Saturday. For my first attempt, and so possibly the World Record (if no one else has done/beaten it) the time was: 9 hours, 25 minutes, 23 seconds. It was 92km of cycling in 10 stages + 103km on 9 train journeys. My initial thoughts were to do a route involving tube/trains, stopping at a station in each borough. Kind of a borough version of Geoff Marshall’s famous Tube Challenge. However I thought that would be a bit underwhelming for a “tour of London” – just railway platforms rather than the public realm. Also, it was a lovely, warm day, and spending the whole day cooped up in various trains and tunnels didn’t appeal. So, I decided to do a bicycle + train combo. If you don’t have a bike, you can probably substitute the cycling sections with a combination of walking, jogging and buses/trams. 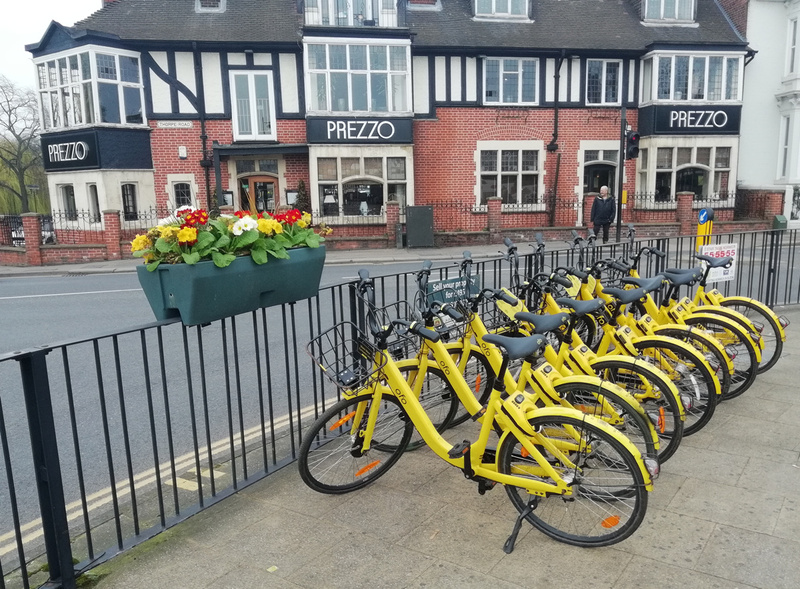 I’d not recommend a bikeshare bike, as if you are cycling nearly 100km, you want something that is comfortable for you for those kinds of distances. Visit all 32 boroughs + the City of London, take a photo in each one to prove the visit. Each photo must be taken from within the borough and must be of a street name sign with the borough name and/or borough crest/logo on it. Truncated borough names (e.g. 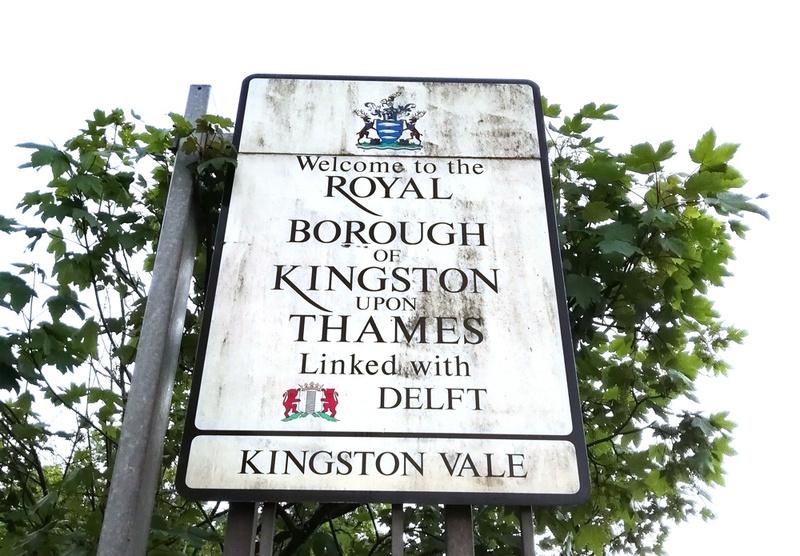 “Barking” for Barking & Dagenham) are OK.
You can also have local neighbourhood welcome signs if they also contain the borough name/crest/logo (e.g. Corbets Tey in Havering, and Pinner in Harrow) as long as it’s not a “welcome to the borough” sign (as you are not standing in the borough when you see the sign!) and as long as it’s not on the edge of the borough (same reason). Note that none of the 9 photos in this blogpost qualify – click on the blue pins in the map above to see the actual qualifying photos. My route was constrained by the inevitable weekend railway engineering works. The main effect this had, on the day, was very limited services out of London Bridge station. The line through Forest Hill was closed, as were the lines through/near Lewisham. This would make the south-east London section difficult, with a long cycle needed from the Greenwich line down to Bromley, rather than a train dropping me near the Greenwich/Bexley/Bromley intersection; and then another long cycle down to Croydon rather than the London Overground dropping me there. I decided to cycle from Abbey Wood, on the Greenwich line, as I wanted to have a look at the brand new station there (it is a very nice new structure!) and thought this would avoid Shooters Hill – it did, but I forgot about Knee Hill – not quite as big, but very definitely a hill. The main issue of the day was that I ran low on my GPS battery and phone battery. The former died completely about 20 minutes before the end of the challenge, so I missed tracing my final route into Barnet. The phone looked like it was on its way out before the end too, but by using airplane mode I was able to eek out the last bit of charge. This however meant I couldn’t risk using it for navigation in the latter part of the day. The location of the sun was useful as a rough compass indicator, but as I only started my challenge at around 2pm, it got dark during the latter part of the challenge and so I suffered some navigational problems thereon. 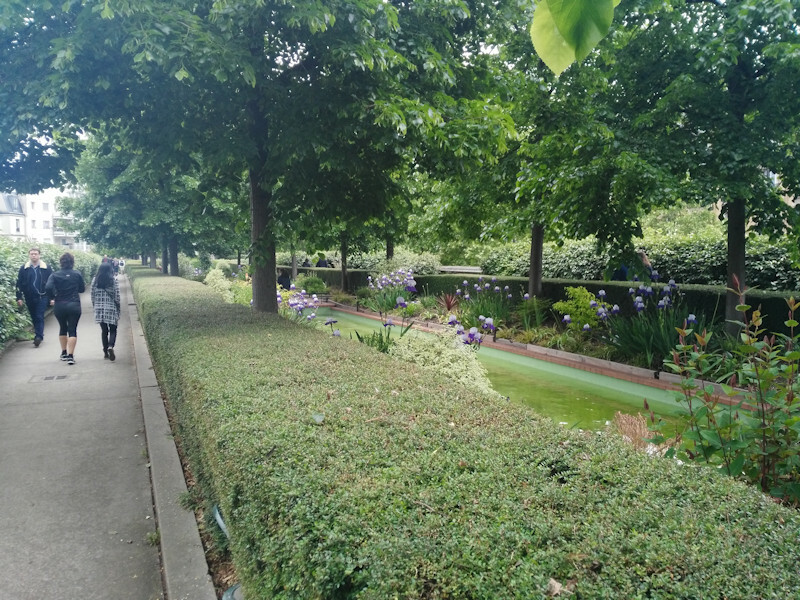 In particular, my route out of Wimbledon station was very poor – I thought I was heading northwards alongside Wimbledon Park whereas I was heading southwestwards. You can see a dramatic and accidental curve in the map above. 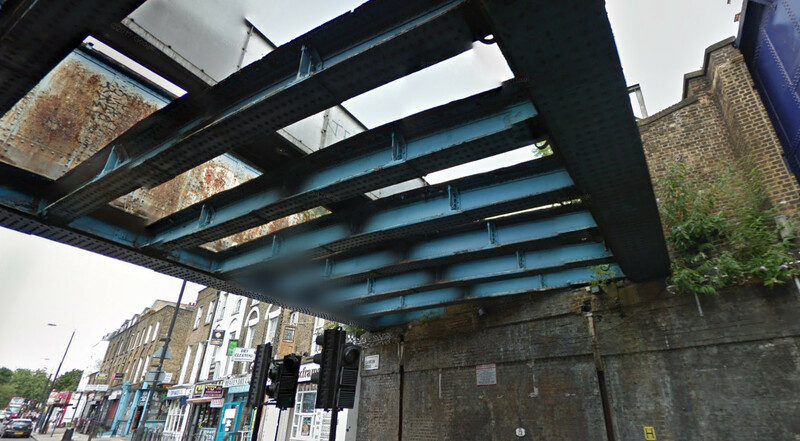 I similarly took a poor route from Richmond Park to Richmond proper, and wasn’t sure of the boundary lines around Turnham Green station, hence some double-backing around here while reading street signs for borough information! (it was nice to see this artwork there though. So, I am sure 9 hours, 25 minutes and 23 seconds is easily beatable. Maybe it will be much faster if done by car, at night? A route much shorter than 195km should be possible, a squint at the map suggests the shortest route would not be much less than 138km. Maybe going via Crystal Palace (five boroughs within a few hundred metres), if you can make it up that hill? 33 stops works out at less than 20 minutes per borough though, and actually finding a “qualifying” sign took quite a while in places. I think I got lucky for some boroughs. 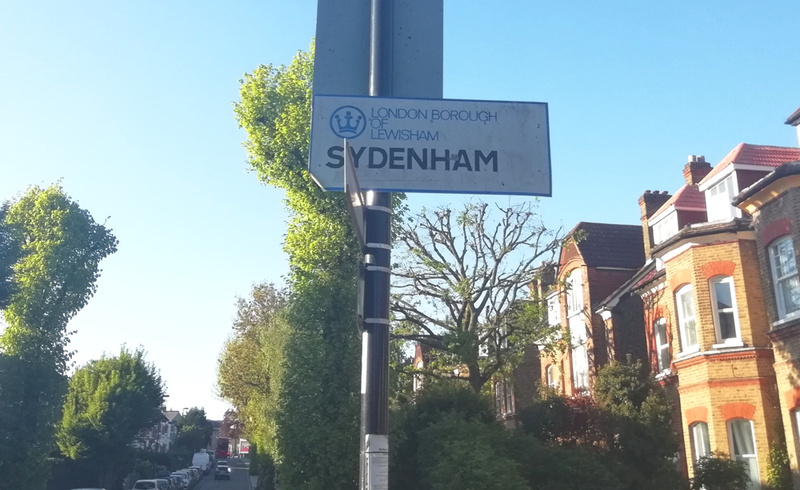 Waltham Forest appeared to have no labelled signs, but literally as I was exiting the borough, having cycled right through it, I found a very old street sign with the borough name on it. 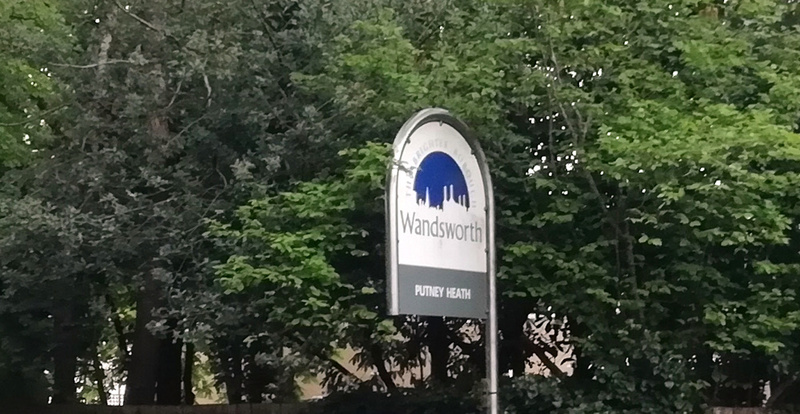 I also think I was very lucky to find a Wandsworth labelled sign. For four boroughs (Bromley, Sutton, Havering and Harrow) I never did find a street name sign with the borough name on it. I only spent a couple of hours planning the route and checking to see what trains were running. I did not do any research into which boroughs would typically have borough names on their street name signs. This proved to be a problem right at the start – which was going to be around the IKEA at Tottenham. A fruitless search for names in this pretty bleak part of London, until I headed westwards into more residential areas. I scribbled down rough timings, planned route (town-to-town) and boroughs. The rough rule that any journey in London on public transport takes half an hour seemed to hold true. My timings suggested a start at 14:00 and finish at 23:45. I started a little earlier and quite quickly made up half an hour by doing the central London leg at speed. I spent the rest of the day consistently 20-30 minutes ahead. I was keen to maintain this so that I could get through Richmond Park before the gates were locked – I forgot that it’s actually open 24 hours for pedestrians/bikes. I used a Google MyMaps map (not the one above) loaded with a KML of the boroughs, to check where I was and where a nearby borough boundary was. I used OSMAnd loaded with an offline OpenStreetMap map of London for detailed navigation when I needed it. Trains generally ran to time, except for (guess who) Southern from West Croydon to Sutton which was around 10 minutes late. OMG the Thameslink loop around Sutton is really very slow – although quite scenic. I don’t know what on earth is going on with the road layout around Barking but it is a complete mess. 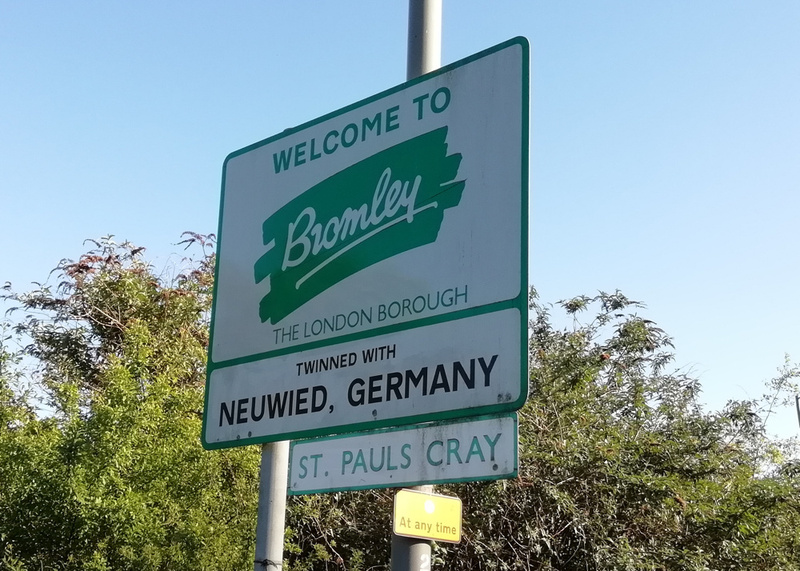 I probably wouldn’t recommend cycling around Crittal’s Corner on the Bexley/Bromley border – and especially stopping on the slip to take a photo of the sign (above). The challenge was a nice way to see a cross-section of London. However I did only spend a few seconds in some boroughs (Camden, Ealing) so it perhaps wasn’t a representative tour of the whole metropolis. The most intense full-on London experience was at/around Barking station, particularly as the street market was on. The nicest bit was, for sure, cycling through Richmond Park at sunset, with its lovely views and herds of deer. Uxbridge Road in Harrow, less so (although it was dark and I was rushing at that point). 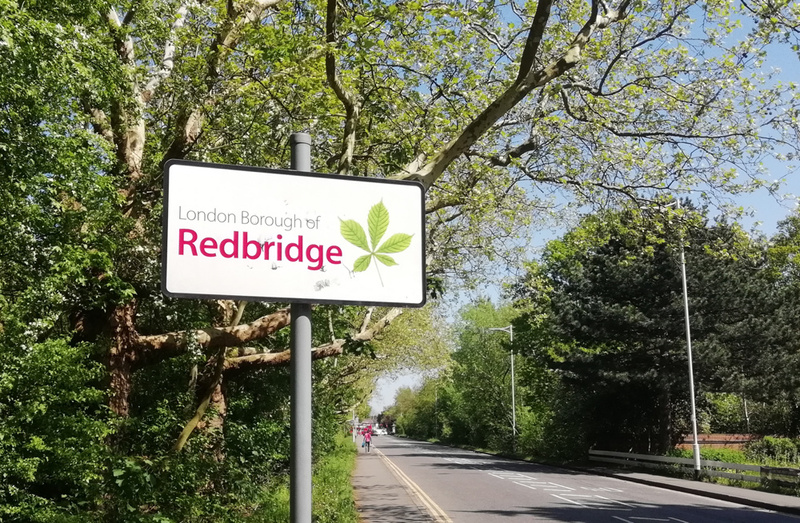 It was good to find some new cycle infrastructure – the new tracks along Forest Road in Waltham Forest and from Aldersbrook to Manor Park, for example. 0 I only got to cycle right across a few boroughs – Waltham Forest, Bexley, Hammersmith & Fulham and Harrow. 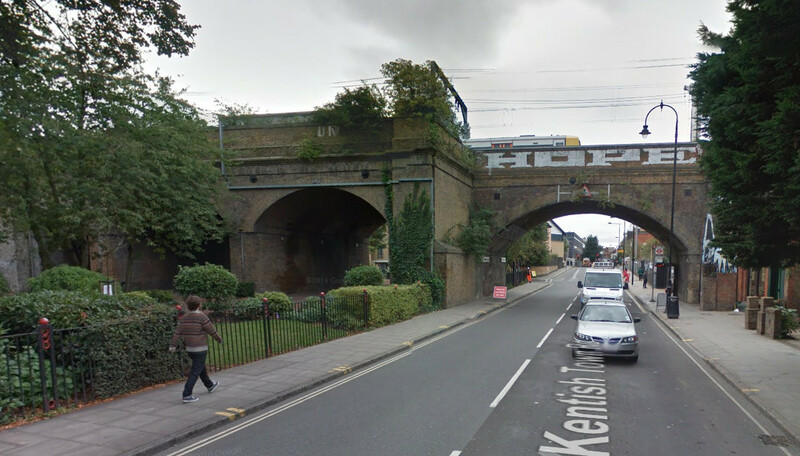 A few – Havering, Sutton and Brent, were just jump out of the train, cycle around a bit, jump back on the next train. I was happy not to have to spend too long in Harlesden. But London is a city of villages and several that I visited were pleasant – Wimbledon village, Wood Street, Sydenham, Alderbrook. Upminster seemed nice enough. Spitalfields was buzzy as ever. 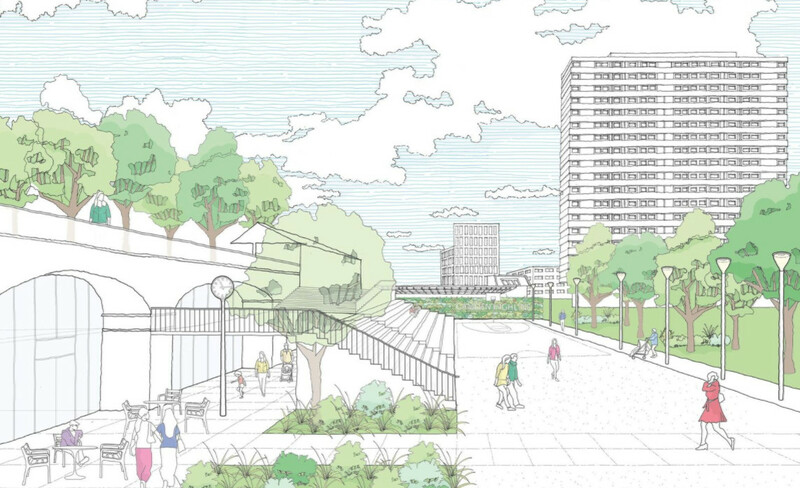 Even Abbey Wood appears to be having an embryonic rebrand as Abbey Wood Village – hello there Crossrail. 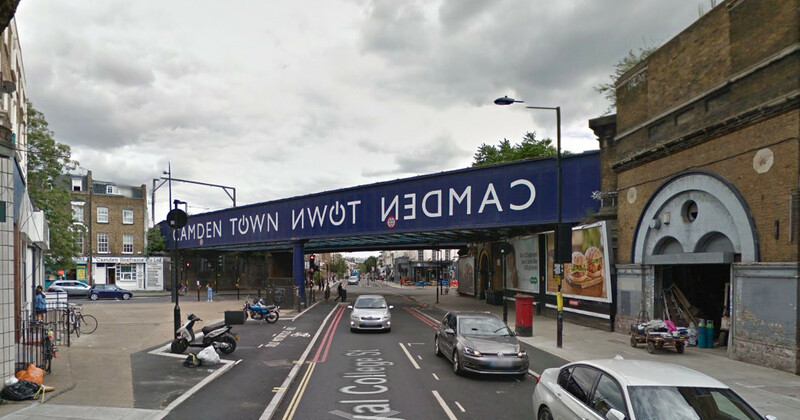 13:50:05 Enfield Start right by the Haringey border, having found a suitable sign. 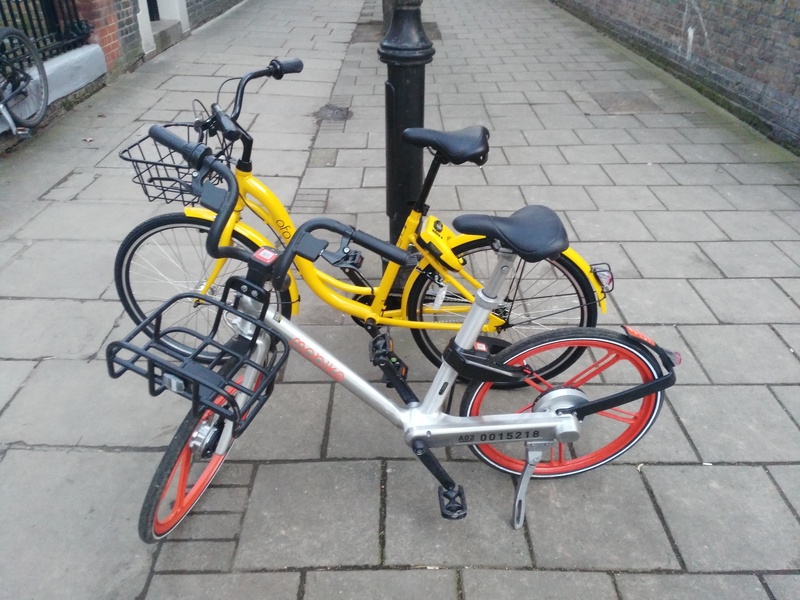 13:54:20 Haringey Followed by a nice cycle through Tottenham Marshes and then along Forest Road and Wood Street. 14:25:57 Waltham Forest Having cycled right through the borough, found a named sign a few metres pretty much on the boundary. 14:27:30 Redbridge A very old sign, for the same road as above, and didn’t find any more. 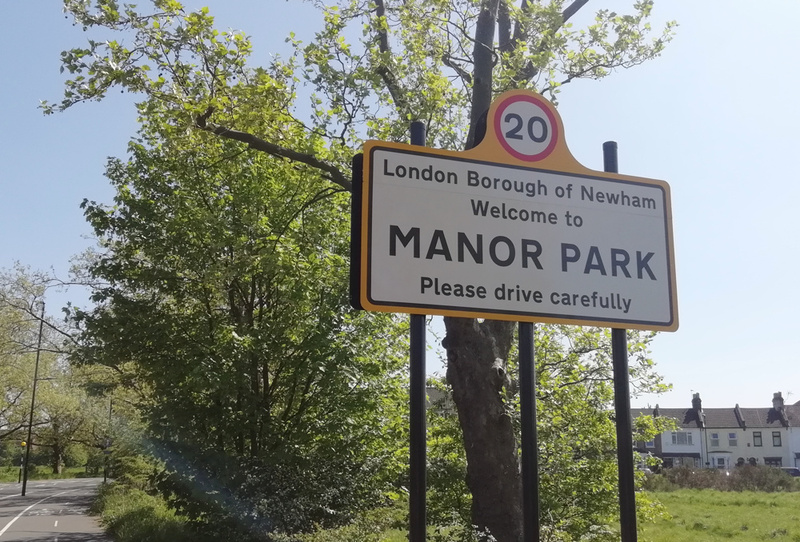 14:37:07 Newham By Manor Park station, with the borough crest on the sign. 14:55:06 Barking & Dagenham A sign for “Borough of Barking” which counts as it’s part of the borough name, even though the sign is for the pre-1965 Barking borough. 15:02 C2C train Air conditioned 🙂 from Barking fast to Upminster. 9 minutes for 12km. 15:19:30 Havering A borough without its name on its street name signs, but found a Welcome to Corbets Tay sign with the borough name/logo on it. 15:35 C2C train From Upminster to, interestingly, Liverpool Street, via Barking and Stratford. 27 minutes for 25km. I think this is a weekend only route. It was packed with Stratford Westfield shoppers. 16:04:25 City of London Like all inner London boroughs, the City of London name appears on all street name signs. 16:17:44 Camden Only in borough for a few seconds. 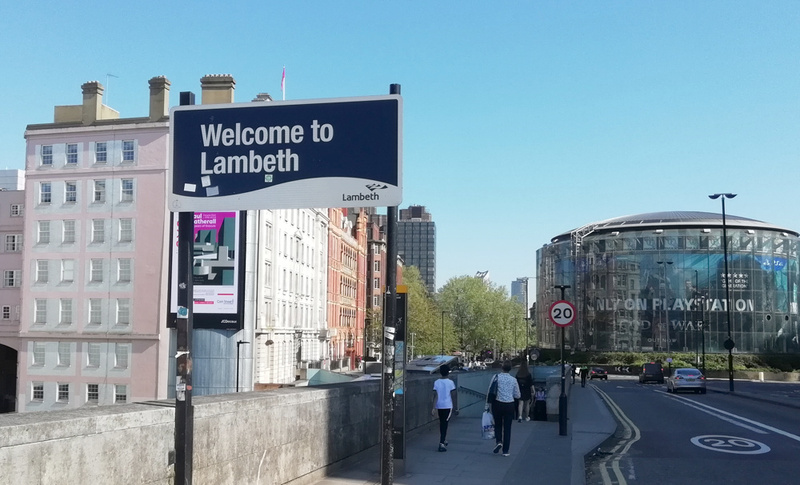 16:27:46 Lambeth The Welcome to Lambeth sign appears at the other end of Waterloo Bridge from the Thanks for Visiting Westminster sign. No-mans-land in between? 17:13:35 Greenwich A long way from Greenwich itself, but not too hard to find a sign. 17:20:57 Bexley Weirdly, Bexley borough street name signs seem to have a “no dog mess” symbol as the “logo”, rather than a council symbol or crest. 17:52 Thameslink + Southeastern trains St Mary Cray to Bickley, and then Bickley to Penge East. 18 minutes for 12km + 6 minute change. In Bromley borough for the entirety of this leg. 18:26:21 Lewisham Most street name signs without the borough name, but found this one near a roundabout in Sydenham. 18:54:36 Croydon Almost no street signs with the borough name on them, so continued cycling past Selhurst, until finally found one outside West Croydon station. 18:59 Southern train West Croydon to Sutton. A bit delayed. 12 minutes for 7km. 19:25:27 Sutton Another borough which hides its identity on its street name signs. So found a fixed bin. Had a nice looking shopping parade though with the borough logo on its gates, and a lovely clock outside the station. 19:37 Thameslink train Sutton to Wimbledon. 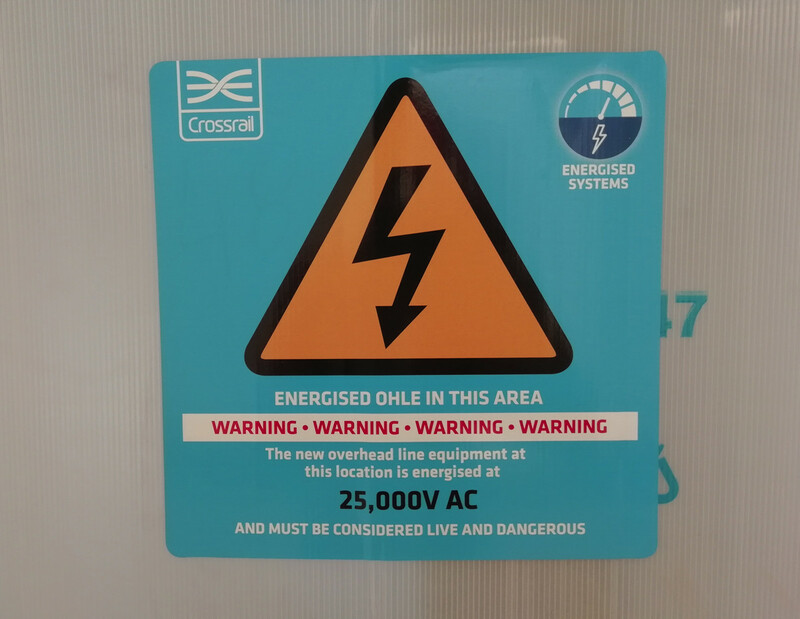 On the Thameslink loop – very slow. 21 minutes for 9km. 20:03:30 Merton Pretty every sign has the council name/logo on it. 20:22:11 Wandsworth With phone battery running low and it getting dark, I didn’t realise I that I did a huge accidental 180-degree loop from Wimbledon Park into Wimbledon village instead of Southfields. Crossed into Wandsworth eventually and found this very old sign, almost entirely hidden by branches – so did some gardening. 20:36:26 Kingston Followed by a twilight cycle through Richmond Park. 20:51:39 Richmond All street name signs mention the borough. 21:04 London Underground tube Richmond to Turnham Green. 9 minutes for 5.5km. 21:17:57 Hounslow All signs have the borough name on them. 21:19:00 Ealing Another “easy” one. Only in Ealing borough for a few seconds. 21:23:16 Hammersmith & Fulham The borough finishes just beyond this sign. 21:31:21 Kensington & Chelsea As you might expect, this Royal borough loves to put its name on all the signs. 21:43 London Overground train Shepherd’s Bush to Willesden Junction. 9 minutes for 4km. With a 10 minute wait for this one too, I probably should have cycled it. 21:59:02 Brent Bizarre spiral route out of Willesden Junction, walking at track level, with the platform (and train) beside/above you, along a very long walkway. Quick loop through, as all street signs have “Brent” on them, to find the other entrance to the station. 22:11 London Overground train Willesden Junction to Hatch End. 20 minutes for 13km. 22:39:20 Harrow No street name signs mention Harrow, but it does have neighbourhood welcome signs. 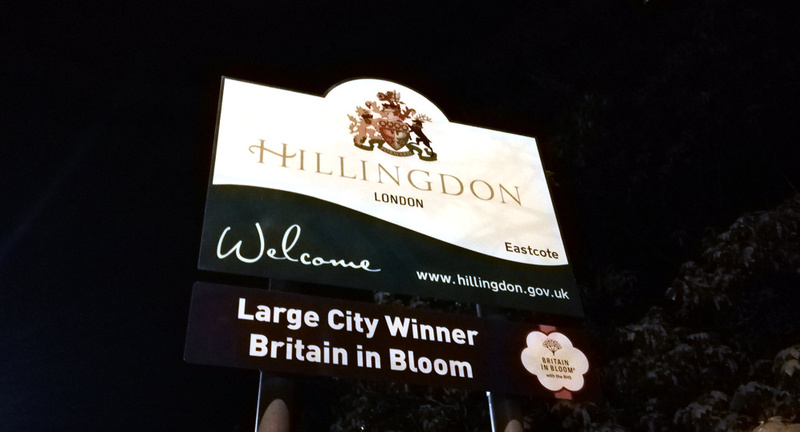 22:47:30 Hillingdon Didn’t realise this at the time (no map), but I’d followed the edge of the borough around. 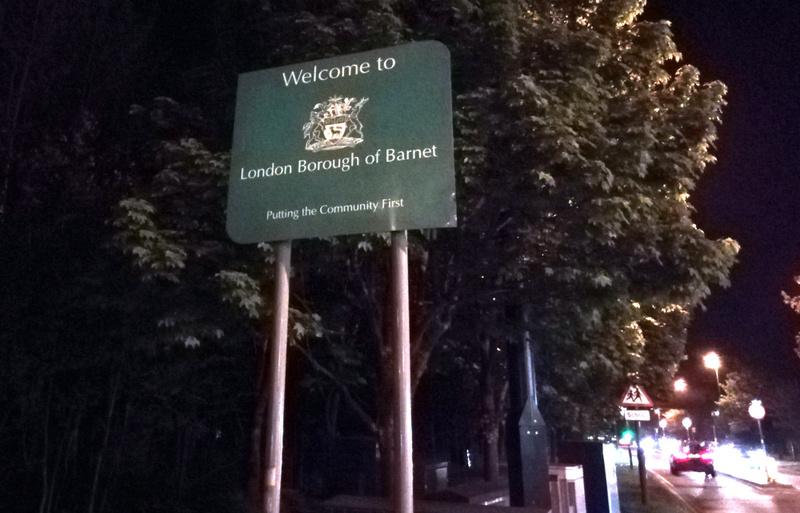 23:15:28 Barnet Tedious and unpleasant cycle along a surprisingly busy Uxbridge Road. They don’t expect cyclists this far out. 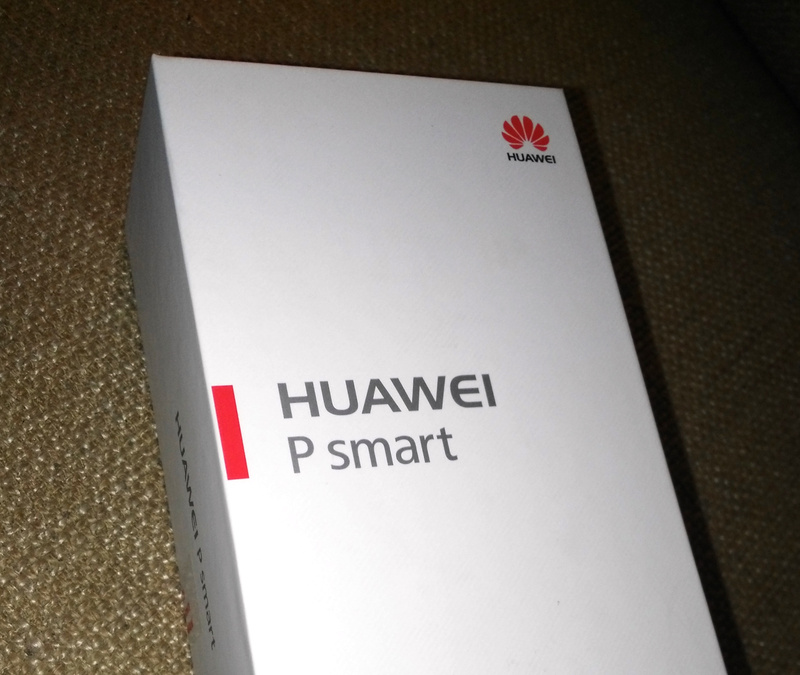 The Huawei P Smart is a new “budget” phone launched by Huawei in the UK in early 2018, around the same time as its premium featured/priced P20 range, but an attractive price-point (£230 list price, in practice around £200) compared with £600+ for the P20 series. Comes in a nice compact Apple-style white box. The fingerprint unlock mechanism is simple to set up and works very well. The phone is a really nice physical design, with a curved edge and nice, black back with thin two metal bars to add a nice bit of styling. The logo is the bottom rather than the top, which is a bit weird but I’m getting used to it there. Comes with USB Micro socket for charging, and a nice compact charger with a pop-up third pin. USB Micro cables/chargers are widely available so it’s good to have this as the charging solution rather than the still rare USB C.
Quite quick to charge – around 3 hours from empty to 100%. Comes part charged (~60%) out of the box. Comes with a decent looking pair of headphones, and a regular headphone socket. The screen is lovely and sharp. Both front and rear cameras take excellent, sharp photos (see the examples above and below). The “Bokeh” effect, while not being perfect (see grumble below) produces really nice “portrait” photos, as long as you have the distance right and good lighting conditions. A great example is a photo I took of a colleague above. 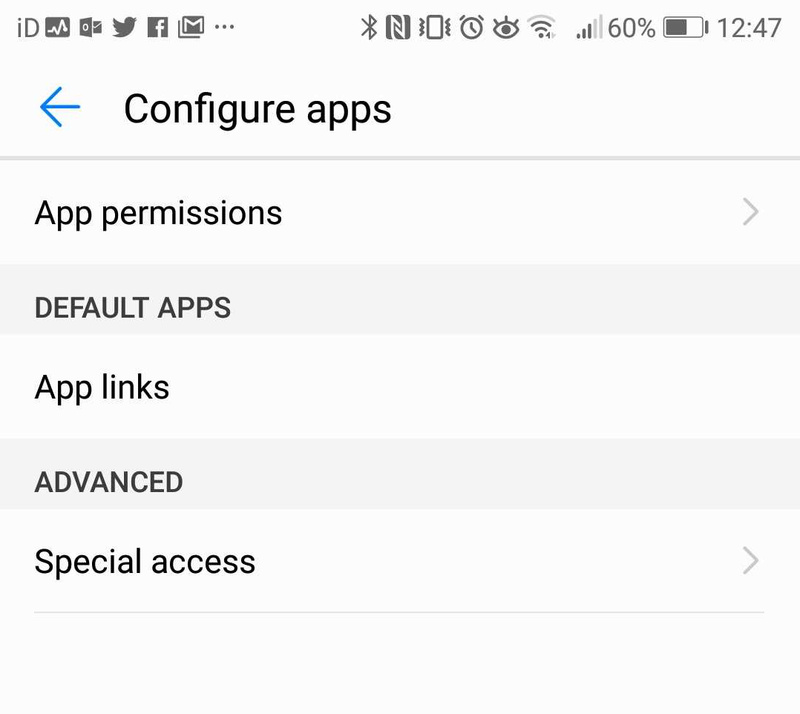 Comes with Android v8 which is a great UI and well designed, with an improved permissions request mechanism and more UI consistency. Definitely a lot snappier than my Ascend G7 was, with the same number of apps loaded/open. Not too many “junk” apps installed on it. Nice auto-switch between mobile network data and Wifi data. One of my perenial annoyances was where I would auto-connect to a Wifi network and then not get data as I was not logged into it. Now, it will just switch back to the mobile data without me needing to disconnect the Wifi manually. Conversely, it will also auto-connect to new open Wifi networks it finds, seamlessly, for saving on mobile data usage limits. 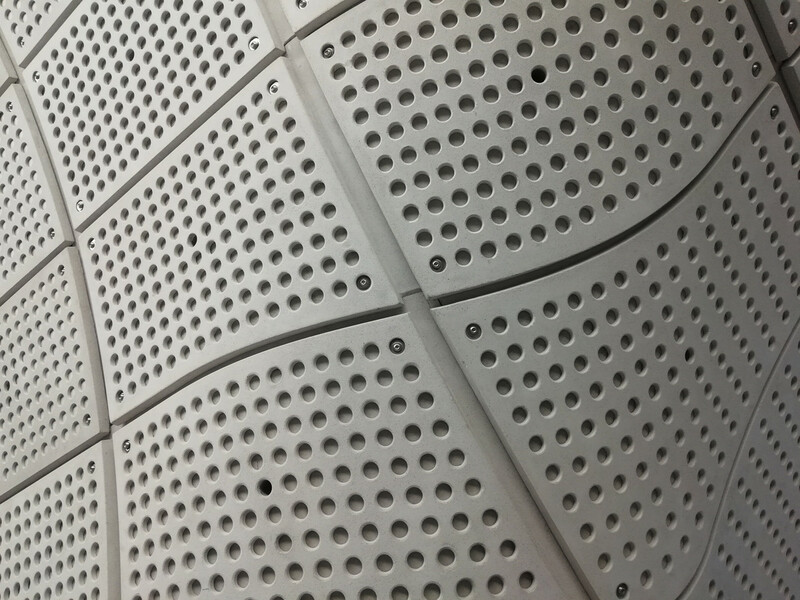 Only a single speaker – but this a good thing, phones are juke-boxes to irritate near people with, the speaker should just be for ringing, or use the nice stereo headphones. It only lasted about 30 hours between its first charge to 100%, and being empty, with “normal use” (no videos). I was hoping it would manage to go 2 days and 1 night without a charge, at least for its first year, like the Huawei Ascend G7 it is replacing. Since then, it’s done a little better. With light use it will manage a couple of days. But if you spend a day at an event (e.g. wedding reception), taking lots of photos and maybe using the map a few times, it will be out of power before the end of the day. This is the first Huawei “budget” phone to have dual back cameras for simulating low F Number effects (allowing for blurring of background detail while bringing the only subject into sharp focus). This works quite well but is not perfect – perhaps because the second camera, which is calculating the depth of field, is low-resolution (2MP). So, it doesn’t quite get the blur/not blur boundary quite right. It is also not obvious how to start using this feature. Basically, it is activated by using the Portrait mode. Photo processing tends to aggressively sharpen images, causing a halo effect for certain shots. The system occasionally pauses/hangs for a few seconds, e.g. when reopening Google Maps, or going from standby to taking a photo with the camera. It’s something that my older phone did all the time, but I was hoping that this newer one would never suffer these pauses. Out of the box, the system uses 7GB of space, so you have 7GB less to play with, than is written on the box (so 25GB rather than 32GB in my case). Slightly confusingly, the space is called “ROM” on the box, which I always thought was Read Only Memory. These days its referring to the solid-state internal memory space for storing files/photos. Conclusion: It’s not perfect, but for £200 SIM-free this is an excellent smartphone, well built, powerful and with some good premium features. Just be prepared to watch that battery, and be patient when waking it. OpenOrienteeringMap, the easy online tool for creating street orienteering maps from OpenStreetMap data, has been updated to version 3. Development for this version was kindly funded with a grant from the Orienteering Foundation. Better trees! We now use SVG graphics for lone trees (and monuments). This means they are scaled correctly when appearing on the map, both on the screen and on the high quality ready-to-print PDFs. The use of SVGs and better scaling means that the trees now don’t dominate the map at smaller scales. In addition, trees are drawn underneath line features, so that they don’t obscure, for example, path detail. The same treatment is applied to monuments, too. This fixes one of the most requested bugs on the OpenOrienteeringMap Github. See above for the difference – note the better scaling, lack of pixalation, and less obscured paths, on the right! Similiar vectorisation improvements have taken place for fences, walls, power lines, cliffs and embankments. These linear features have regularly spaced markings to indicate their type. Previously, these markings used PNG images, which did not work well for the high quality vector PDFs. These have been replaced with SVGs, which scale correctly and print at high quality, through the use of a different kind of Mapnik symbolizer – a MarkerSymbolizer rather than a LinePatternSymbolizer. The only remaining raster graphics that appear on an OpenOrienteeringMap are the fill textures for polygon areas, such as vegetation undergrowth. These use PolygonPatternSymbolizer, which does not support SVGs and has no equivalent symbolizer which does. We now include benches, picnic tables and litterbins on the maps. These are shown as small black crosses. JPEGs can now be produced for OpenOrienteeringMap. This is very useful for adding OpenOrienteeringMap maps to platforms like Routegadget or OCAD (as background map) where JPEGs are required. PDFs should still be continued to use for printing, as they will result in a much higher quality map, but you no longer need to manually convert to JPEG using an image editor or other additional software. In conjunction with the above, geolocation “Worldfiles” can now be produced for OpenOrienteeringMap. These are small config files that allow a JPEG (or PDF) OOM map to appear in the correct place on a location-aware service, such as Google Earth, Mapper from the OpenOrienteering project (not tested) or similar. Some of the details from the “Pseud-O” map style on OOM have been ported across to the standard “Street-O” maps. This includes trees, monuments, powerlines, sports pitches and hedges. Some layer reordering – contour lines now go across roads and above buildings. The shape of the land is important, and so this change makes it easier to see hills and slopes. Buildings on the Pseud-O map style are now shown as grey with black borders, rather than all black as before, this stops them from overwhelming the Pseud-O map in city centres. A new style, Blueprint, has been officially launched. 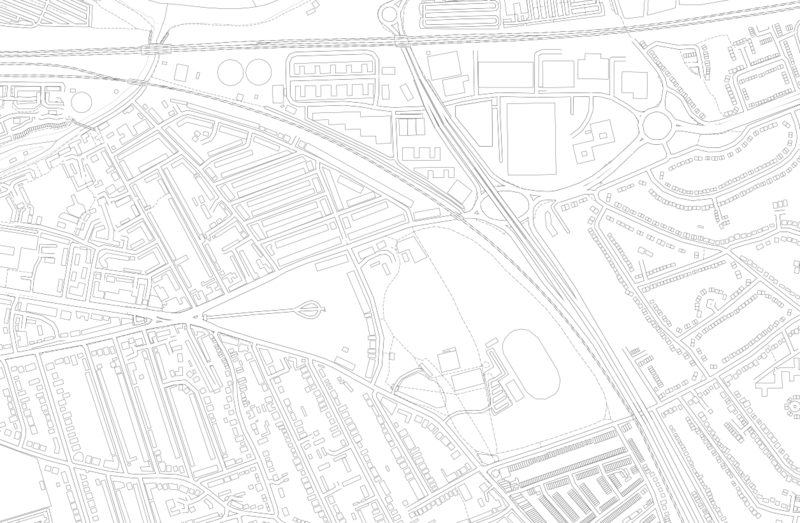 This style (see example at top) which was in beta for a while, is different to orienteering maps, as it is designed for people who want to create a map of their local area to colour in! A simple set of very think black lines, with lots of white spaces, is produced, allowing a simple high-quality map of local areas to be produced, ideal for colouring in! Blueprint doesn’t include contour lines and doesn’t allow controls to be added. You can try it out here. The global map database has received a bulk update, so now covers changes/additions made to OpenStreetMap up to around early August 2017. The UK database continues to enjoy daily updates (changes appear approximately 48 hours after the corresponding edits in OpenStreetMap). 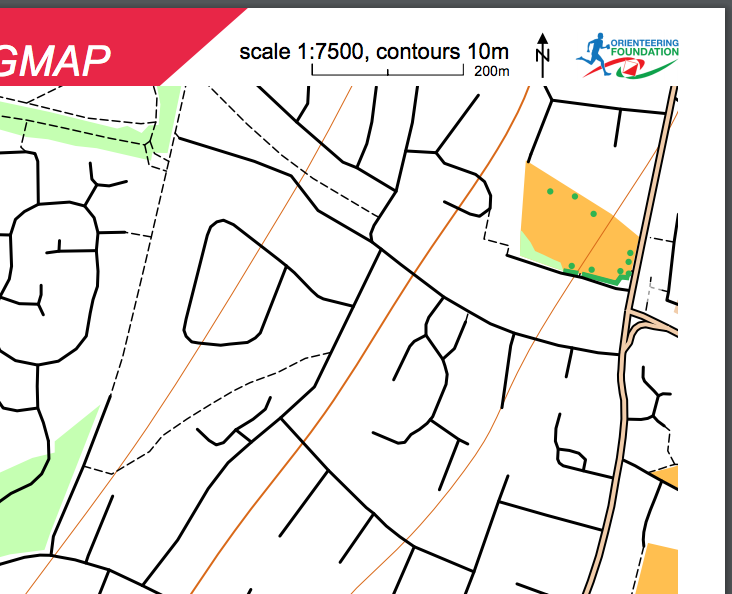 Branding of the website and the PDF maps has been updated to recognise the support received from the Orienteering Foundation. The grant also partially supports the hosting/bandwidth costs associated with OpenOrienteeringMap for the next twelve months. 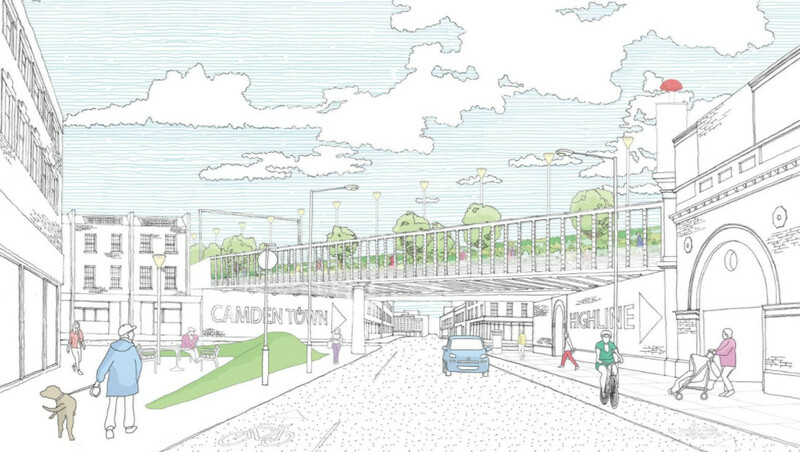 The Camden Highline has smashed its crowdfunding round, which aimed to fund a formal feasibility study and architectural plans for the project, along with creating a community organisation to govern the project. The target was substantially beating due to a late, large donation from Camden Market, along with one from the Major of London, and Camden Unlimited (the organisers of the project so far). The Telegraph published an article noting the successful funding, which references this blog. Camden Unlimited themselves also ran a short interview with yours truly. Here’s a photo from the interview, of me looking contemplative. 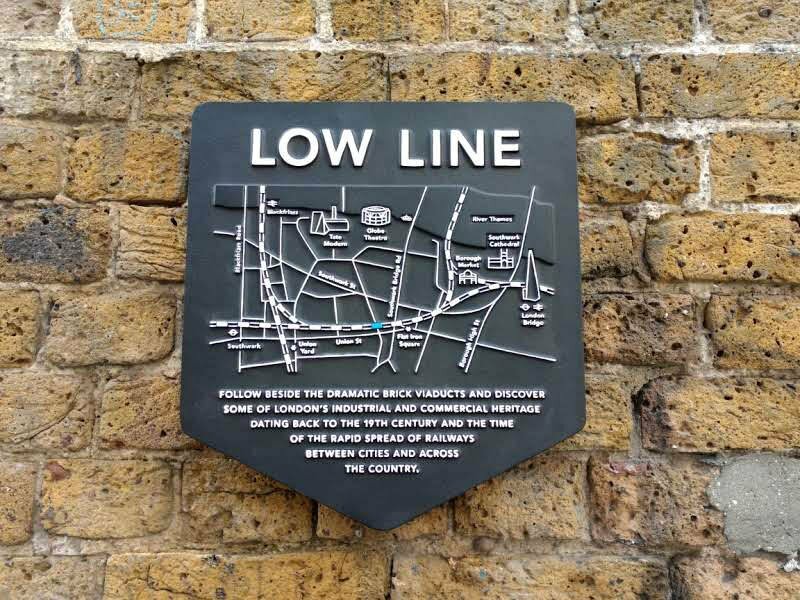 Dropping down a level and crossing the Thames, the London Low Line launched last week. Created by Better Bankside as part of the Bankside Urban Forest project, it is a series of markers, map plaques and paper guides, to the many publicly accessible arches below the railway lines in the Bankside area, out of London Bridge, Cannon Street and Blackfriars stations. 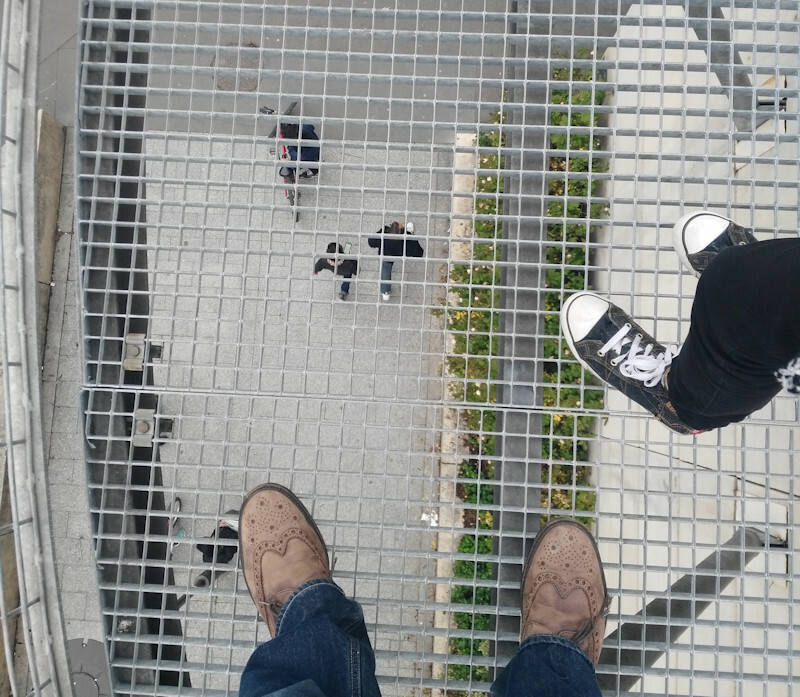 Photos from Better Bankside and Camden High Line. I didn’t walk along the section section, which is always open and accessible to bicycles as well as pedestrians. The western section is pedestrians only and is locked at night. A section with tall bamboo on either side, creating a natural tunnel, was also of interest. There was a little bit of antisocial behavior in a couple of sections, but this didn’t spoil the general atmosphere. It was surprisingly busy, with a mixture of local walkers, families (it was a Sunday afternoon) and quite a lot of joggers. 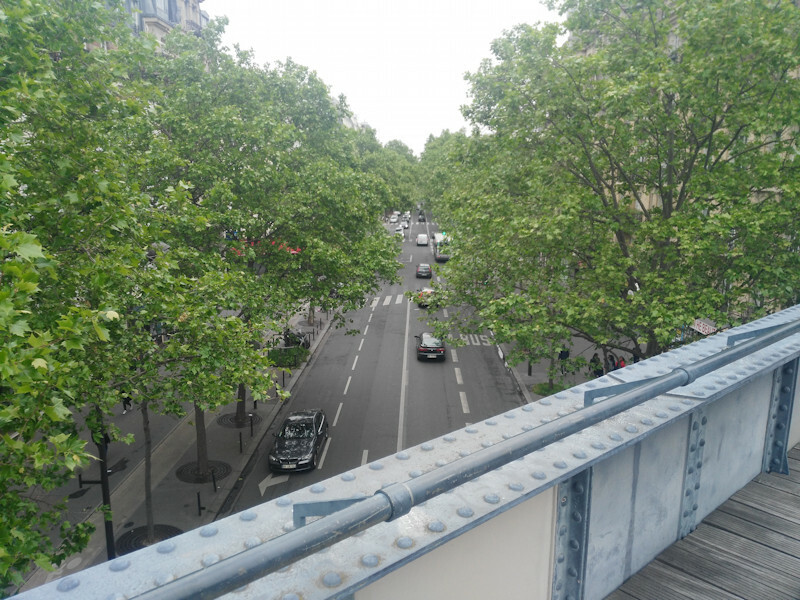 Like the New York City version, there is the interest of passing through (and over) a building, which intrudes on to the route in a dramatic way. 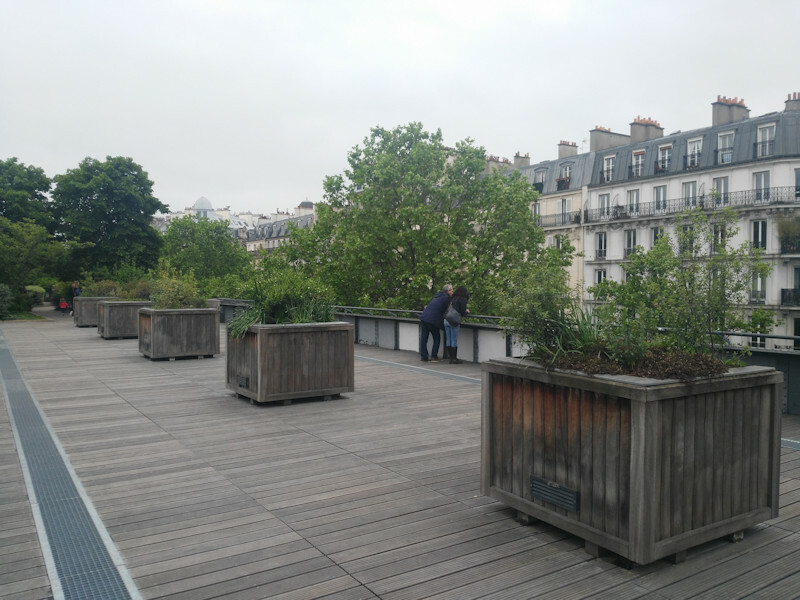 Unlike New York City’s version though, there is no trace of the original railway track, with the ballast and rails completely replaced by a mixture of wooden decking and concrete paths, along with plenty of flowerbeds on either side. 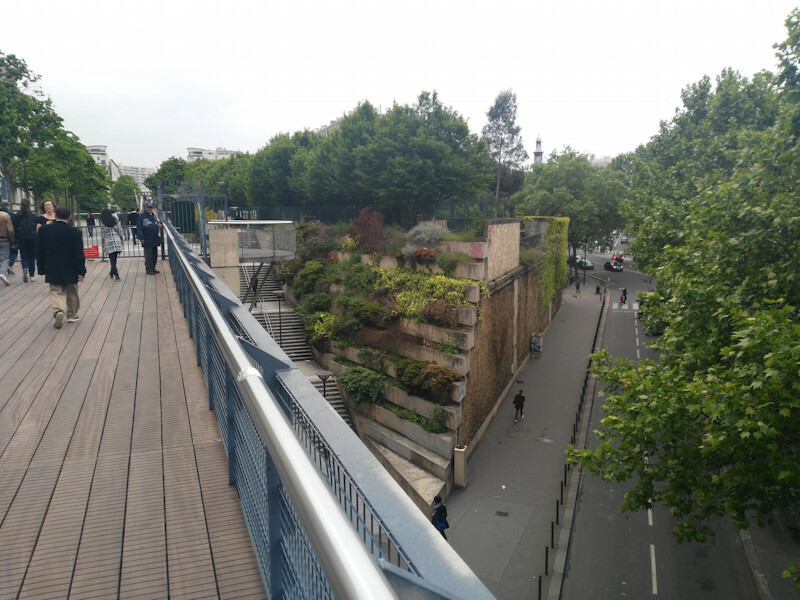 It was good to walk the Promenande Plantée, and great to see it so well used, considering its age and that it is not in perfectly maintained condition. Even though it is only 1.6km along, I took a good hour to do the walk, allowing plenty of time to study some of the murals and other small artworks along the route, both official and unofficial (including a piece by Invader), as well enjoying what is essentially a long, thin public roof garden in the heart of a metropolis. 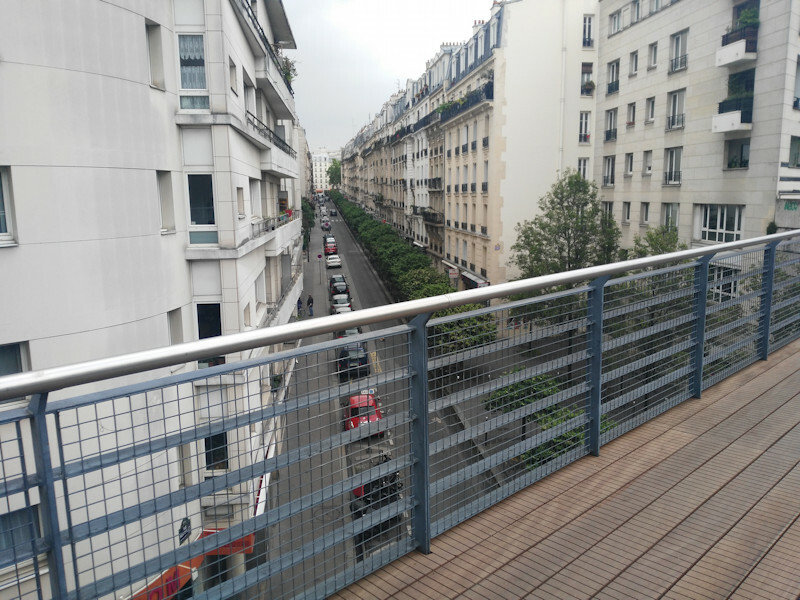 A couple of years ago, I wrote about a number of possible London “High Lines”, London’s own raised “rail trail” to New York City’s High Line and Paris’s Promenade Plantée. Now it looks like the best one could be happening. 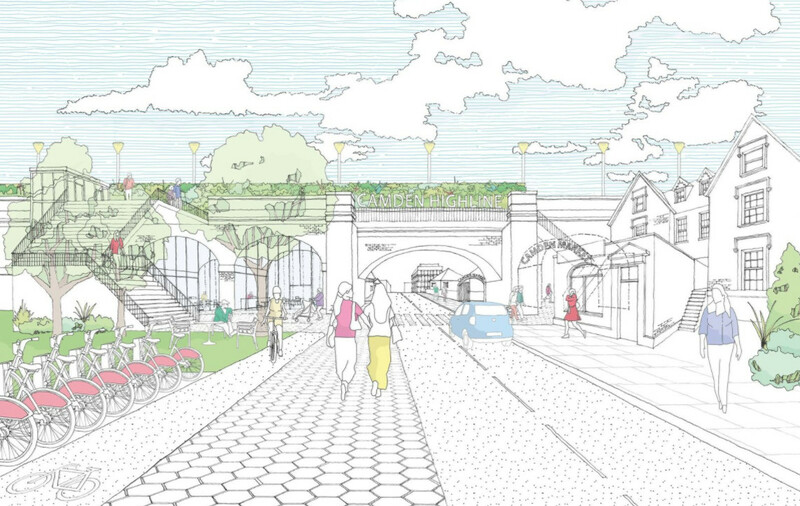 Camden Town Unlimited, the business improvement consortium for the area, are proposing a Camden Highline, which would run for around 0.8km, between Camden Town and Camley Street, which is itself 0.8km from the back of King’s Cross Central. Below is the start of the route, there is a little park here which could provide space for an access point. From the photo, it looks like the operational railway is close, but the route quickly moves away, around the back of Camden Road station. 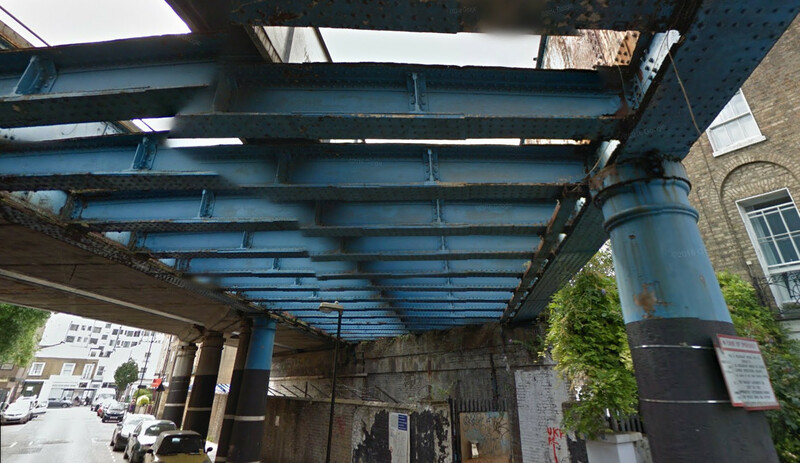 Although there is no public access to the route itself currently, you can get a good idea of the space and route, from Google Streetview, looking up from the streets below. I have included views from below the various bridges, in this post. 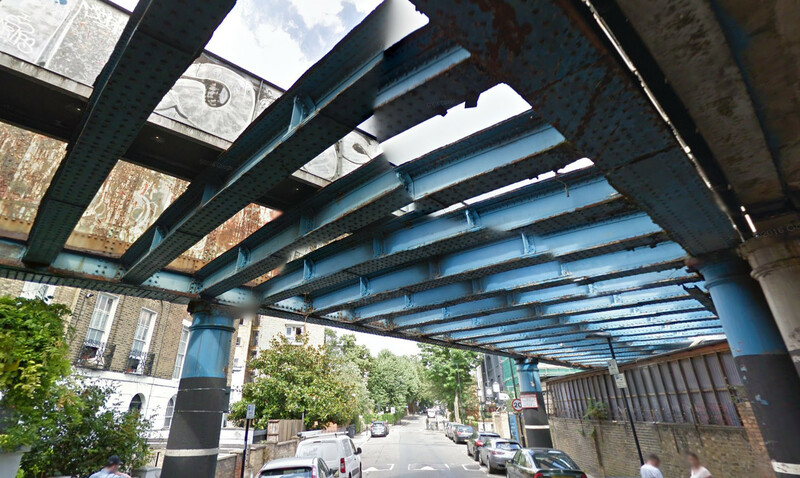 The route uses a surprisingly wide corridor of unused railway, mainly alongside the existing North London Line but including a substantial hidden space behind Camden Road station, and seven bridges across eight roads. The route is as wide as 18m in some sections, with narrower sections at either end. The route ends here (photo below), at Camley Street. To the left is a new bridge for the railway. There is actually still space on the new bridge here for a narrow walkway, and a ramp on the other side means no need for a new access point. However, the land in front is also currently empty, and so could quite easily accommodate a new route down, potentially as part of a wider development of the plot. See the official Camden Highline website. All photos (c) Google. Illustrations from Camden Town Unlimited.